We walked through the part of the Riverwalk which runs from the Blue Star Art Complex up through King William last weekend, marveling at all the lovely period houses lining quiet, tree-lined streets. Although right next door to each other and very nearly of the same vintage, King William and Southtown have completely different sensibilities. The old Southtown houses are smaller, closer together, and many of them are more given over to commercial and artistic enterprises. 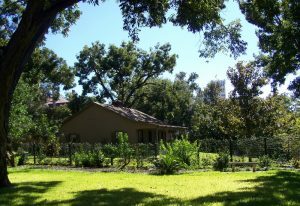 While King William neighborhood does have a number of smaller bungalows and cottages lining the streets, it is the mansions and extensive gardens which set it apart; and one of the most splendid (after the Steves Homestead) is the Villa Finale – the home of the conservationist who put King William on the map as far as historical districts go. The area was San Antonio's first extensive up-scale suburb, beginning around the mid-19th century, when well-to-do German merchants and industrialists like C.H. Guenther, of the Pioneer Flour Mill began building stately mansions on what had been the outlaying farmlands attached to Mission San Antonio de Valero and Mission Conception. That first glorious heyday lasted until well into the 1920s, when the well-to-do began being drawn into newer developments in Alamo Heights and Terrell Hills, on rising land to the north of downtown. Many of the stately mansions became boarding houses, or broken up into apartments, and the area gently – or precipitously –decayed. The credit for reviving the neighborhood and kick-starting restoration of many of the historic mansions and residences is usually given to Walter Mathis; a descendent of several local notables, including John W. Smith, last messenger from the Alamo and later Mayor of San Antonio. After service as an Army Air Corps combat pilot during WWII, he turned to investment banking, civic good works and collecting art and memorabilia. Late in the 1960s, he bought the house presently known as the Villa Finale and spent several years in research and meticulous repair; a splendid Italianate pile with a three-story square tower at one side. He filled the house with fine furniture, art and the results of his own enthusiastic collecting, lovingly landscaped the grounds ... and then turned to other houses in the neighborhood, purchasing at least fourteen other houses and either restoring them entirely or in part, before re-selling – often on very favorable terms – to friends and acquaintances who could carry on the restoration. His efforts kick-started establishment of King William area as a National Historical District – and since then, of course, much are envied those homeowners who were either lucky enough to inherit property in the area, or who were perspicuous enough to acquire it for a song, way back then. 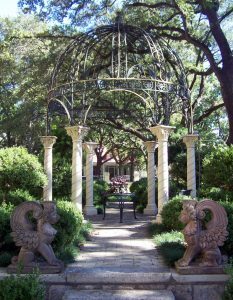 The Villa sits on King William Street and backs on the leg of the Riverwalk which runs through King William. 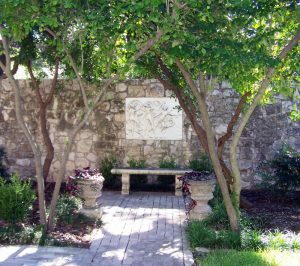 The garden features a gazebo and a long wall separating it from the mansion next door – adorned with inset relief carvings. At this time of year the plantings are plain but serviceable; nothing spectacular or elaborate; just well-tended native plants or native-adapted plants and trees. There is a charge for visiting the house itself, but none for visiting the grounds and garden.